Nico is fearless. He loves slides and diving boards and sneaking over to the deep end. Mario is the eldest cousin. Causes no trouble, defends his sister and tries to keep Nico in line. Yessi immediately poses whenever she sees a camera. She's all drama, bossy girl and sugar rolled into one. We adore her. And he loves nothing more than to annoy the ever living heck out of her. I swear it thrills him. They are cousins and they're growing up together just as I'd hoped. 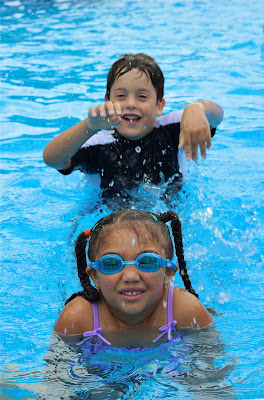 They love to be together, argue, swim and play (in that order). 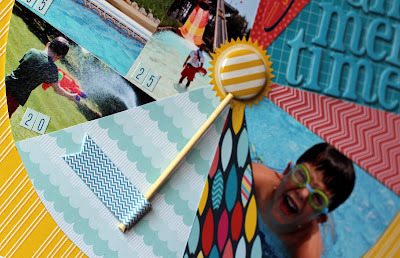 And a sneak at what I've been doing with the stacks of pool pics I've been collecting. 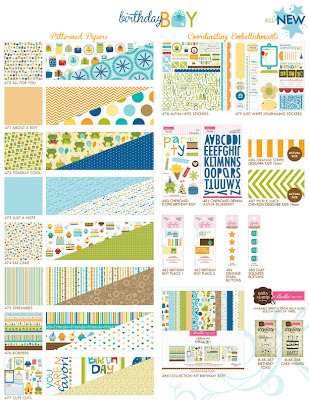 Layout should be up at twopeasinabucket.com very soon. Anonymous said...Love your layout Nancy! Echo Park is one of my favorites. 2 Peas name is AnissaScraps. Congrats to the winners! I'll be in touch shortly to let you know how to collect your prizes. Enjoy! As Nico gets older, I find myself reaching for his baby photos more and more. I think it's my way of actually re-living his babyhood without actually having the baby part. 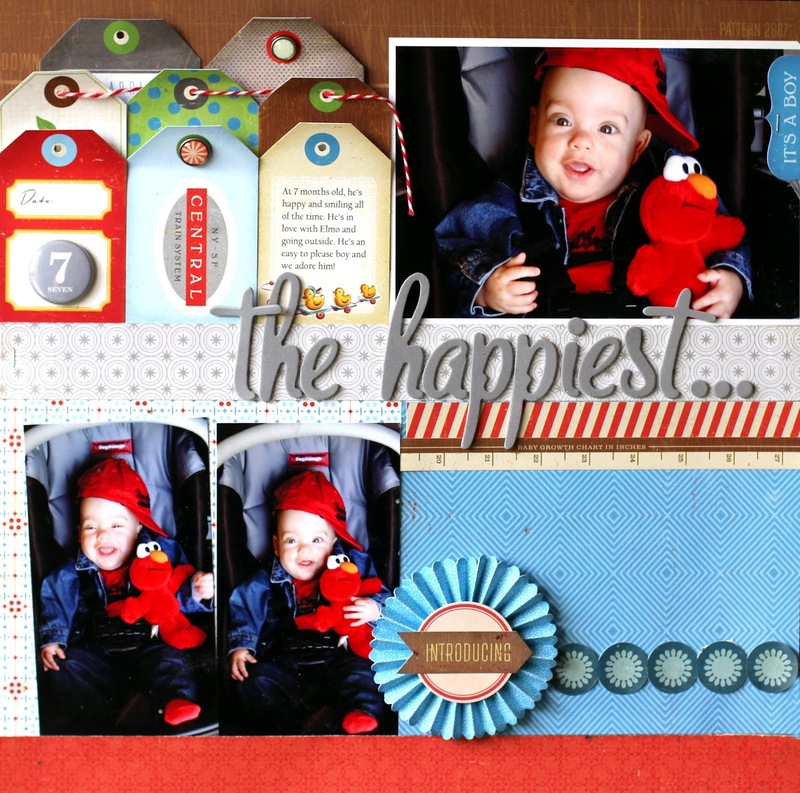 I pulled this set of photos out and wasn't sure if I was going to go with the Elmo theme, or something a little more neutral. Getting these papers from Crate Paper's Little Boy Blue collection pushed me in the neutral direction. I guess Elmo stands out enough in the pictures that he really needs no extra "theming." My favorite part of the collection is the deep, rich color palette. It's vintage, but not pale and I like that. The bold colors are set off by adding doses of gray and wood neutrals. This lets that bold blue and red pattern really stand out. View the entire collection by clicking on the icon above. The first paper I reached for was this great tag paper. I cut it up and lined them up, making nice textured rows of tags. 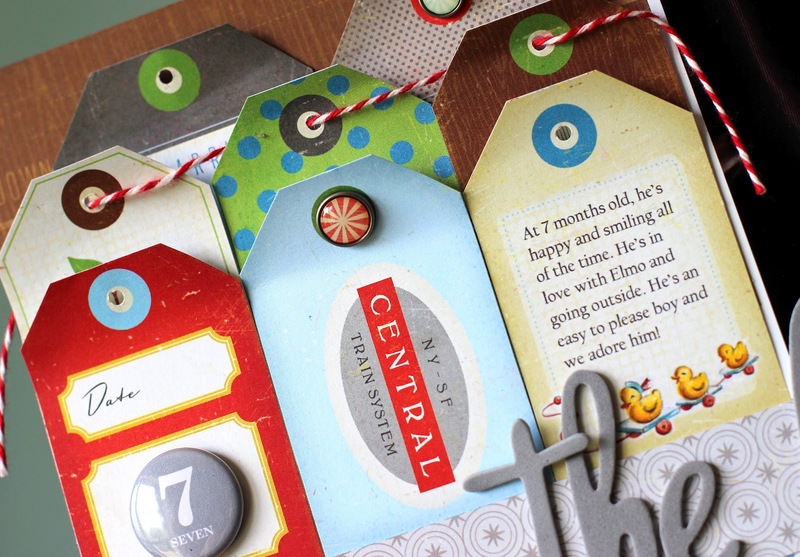 I added some brads and twine to break up the "flatness" of the tags, a gray flair button to indicate how old he was (just 7 months) and a little journaling for my story. For decoration I added an accordion flower, a label sticker and a wood-toned sticker. The flower was grounded to the layout on a strip of blue border sticker. This repeats the colors in the layout and adds something fun (without being overly feminine) to the page. It's time for the Echo Park blog hop. Leave a comment to be entered! 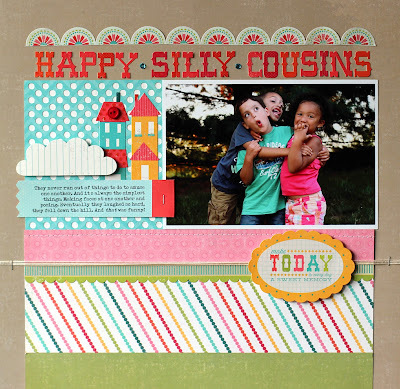 I decided to highlight just a single photo on this layout about DS and his silly cousins. It was the best photo in the batch and was perfect for the story I wanted to tell. 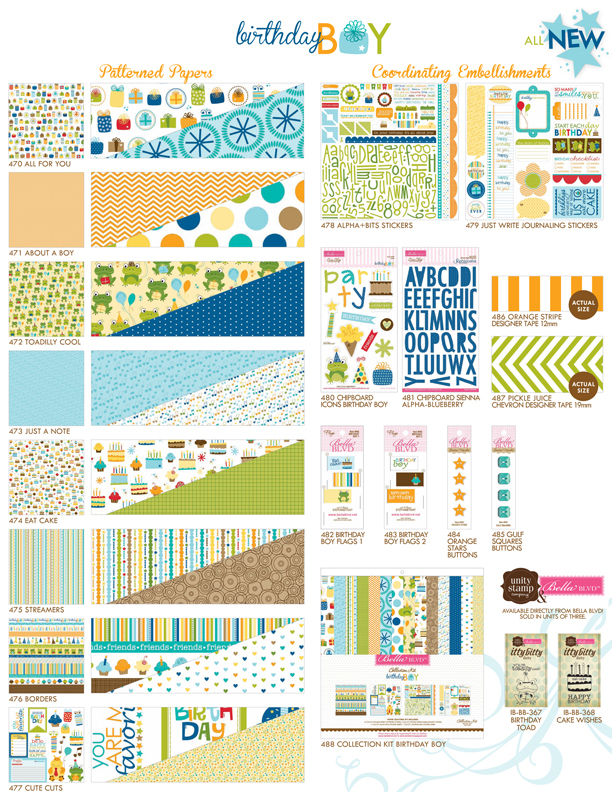 I used the So Happy Collection by Echo Park with it's bright, happy colors and patterns. 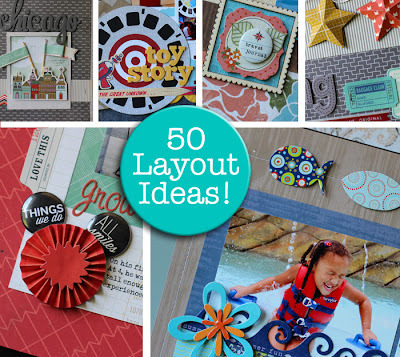 Using a completely neutral background, let's all of those colors shine without competing. 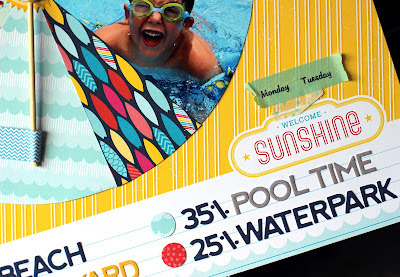 I love the carnival font alphabet stickers in shades of orange, red and hot pink. The journaling block was started by cutting a block of polka dots on the Silhouette. This added texture and a pop of color. 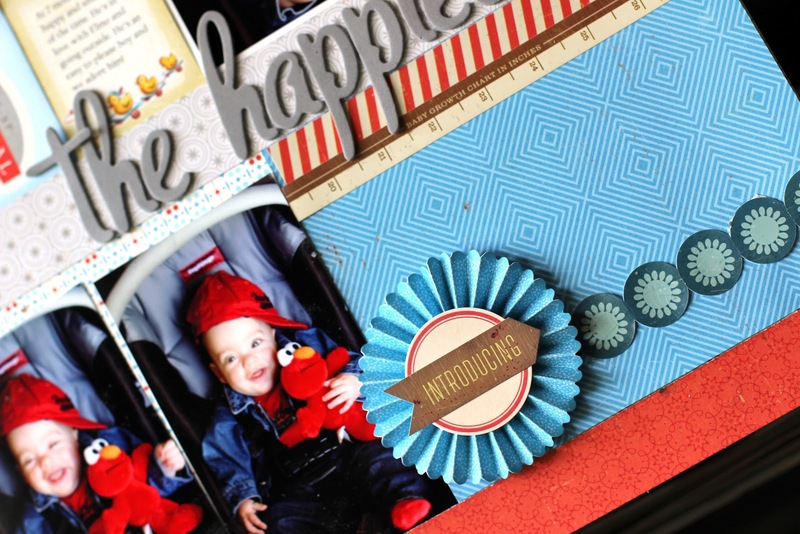 The houses and cloud stickers were used to reinforce the "family" theme of the page. The journaling was printed on a strip of double-sided card stock from the collection, trimmed on one side with decorative scissors and folded and stapled on the other. 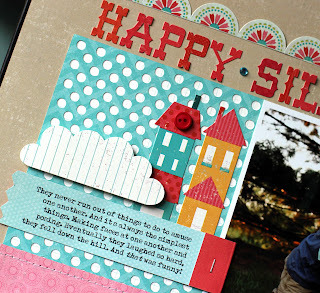 This was a fun, happy page that came together quickly! 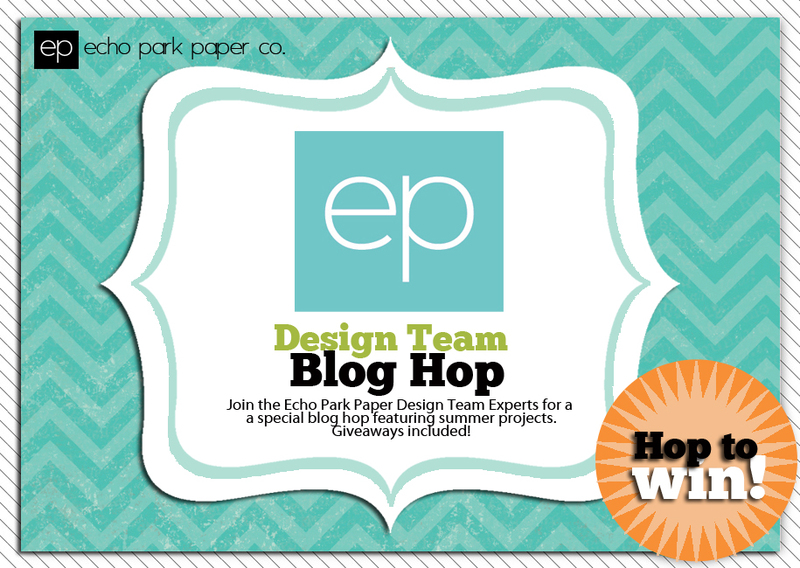 Welcome to the Echo Park Paper Design Team Blog Hop! 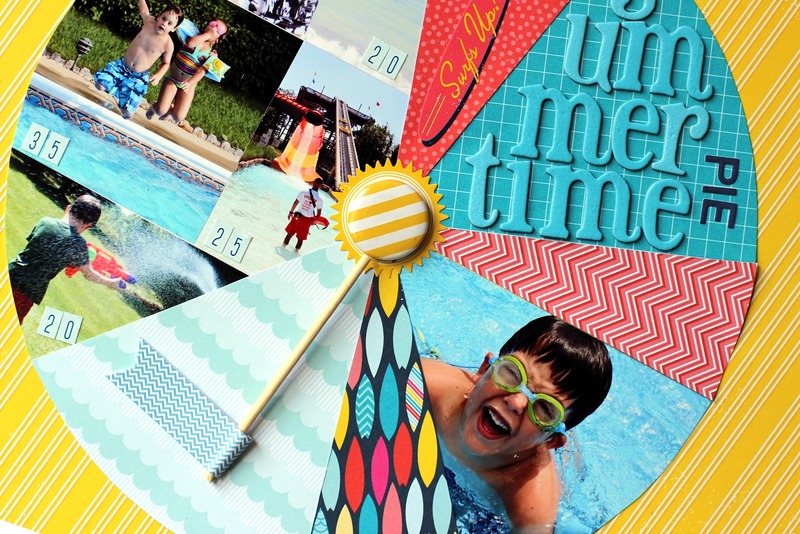 Today the Echo Park Paper Design Team is showcasing projects from our latest collections. 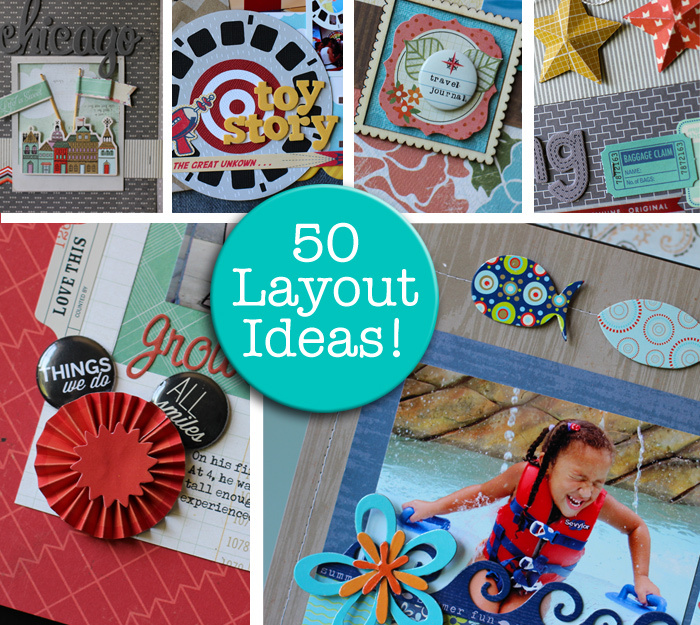 Be sure to follow the blog hop list below as you hop from one blog to the next. Return to the Echo Park Paper blog at any time for the next blogger on the list in case you get lost or confused! ONE winner will be selected from each blog to receive an Echo Park Paper collection kit of their choosing. To qualify for the kit, comments will be due by midnight EST, Sunday, July 22nd to qualify for the drawing. 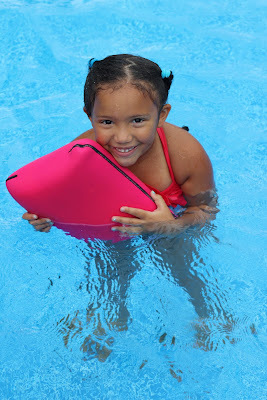 The winner will be announced on each blog Monday, July 23rd so be sure to check back to see if you've won! Whoops, I almost forgot! I have one spot to give away in the workshop. 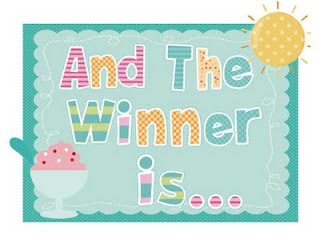 If you'd like to enter, just leave a comment and I'll choose a winner on 7/22/12. If you're already in the class, no worries, 2Peas will credit your account. So whether you’re still in the planning stages of this year’s vacation or sitting on stacks of old photos, Nancy’s got a plan for you! Join her as she guides you through a step-by-step process to divide, conquer and scrapbook those vacation photos. 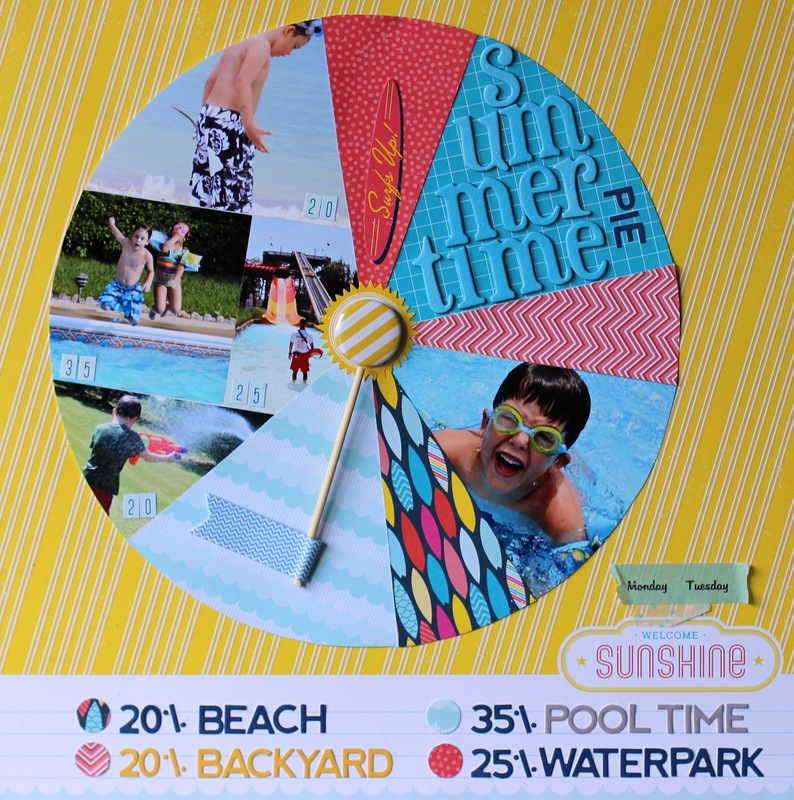 Included in the workshop are 50 brand-new scrapbook pages showcasing a variety of family destinations, helpful, printable PDF's and 5 brand new videos to walk you through the ins and outs of organizing and scrapbooking your vacation. 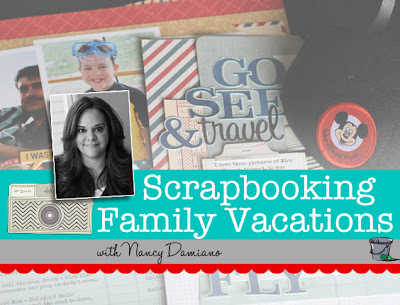 Each video covers Nancy's approach to tackling vacation layouts, her perspective on using design in your pages and the creation of a layout from start to finish. It was an amazing experience and I truly hope that you enjoy the class. It's a collection of some of my favorite vacation layouts and stories. Not sure if the class is for you? Shoot me an email or comment right here and I'll answer any of your questions! 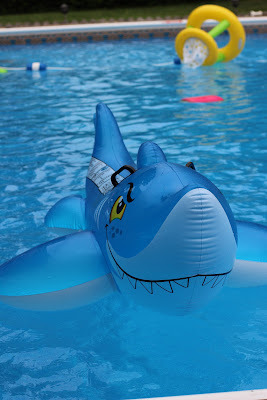 Welcome Bella's Birthday Boy collection, new for Summer CHA'12. 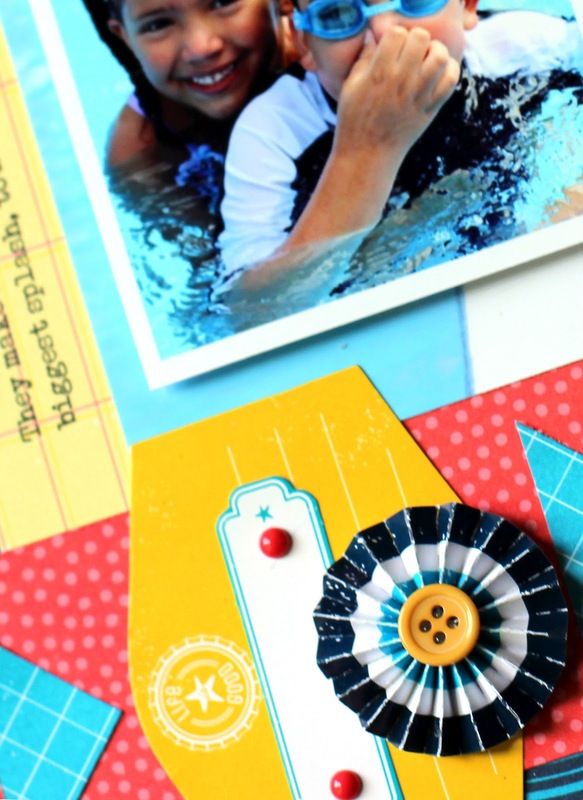 Love the brand new washi tapes and large chip letters in a beautiful shade of true blue! This is going to be a favorite. Check back each day for a new reveal. To see the entire collection, visit the Bella Blvd blog. Happy Fourth of July! We're out the door to escape this heatwave and spend some time with family in the pool. A quick layout I made for the Bella Blvd blog that I thought would be perfect for today. These pictures were taken on the 4th exactly one year ago. Here's to hoping that my niece and nephew have gotten the hang of sparklers since then. Click right on the pic below and enter code SHIPAT40 for a nice free shipping sale from Two Peas if you're headed over there. Stay cool. Enjoy a BBQ and r-e-l-a-x. That's the plan! 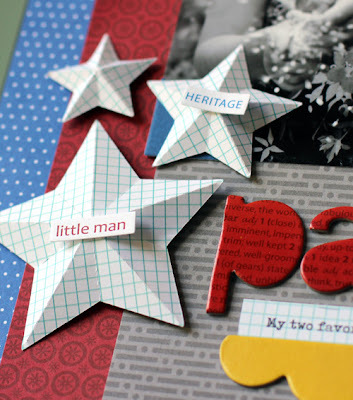 Stars are a Silhouette cut (3D Stars). I have a new video that just went up over at Two Peas for Memory Keeping Monday. 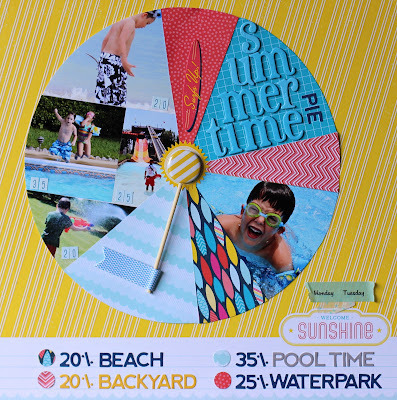 Take a peek at how to create a summertime pie chart with American Craft's Shoreline collection. It came together pretty quickly, once I decided where to place the photos. I'd love to use this format for some of my travel pages as well. I love the bold colors in Shoreline. The small wave pattern is a favorite that I can see myself using over and over again - for beach, pool and waterpark photos. 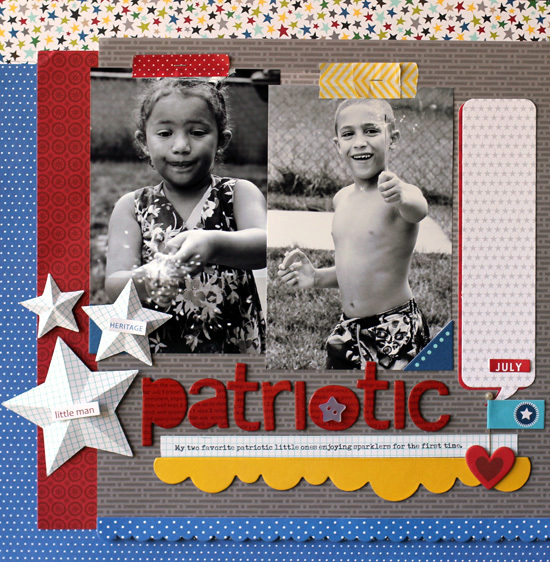 Be back soon, working on some patriotic layout I hope to share for the fourth. In the meantime, I'm trying hard to stay cool (which means scrap more).